In your lower back region, there are nerve roots, which can get compressed or it has been seen in some cases that there is a crack or bulge near sciatic nerve. Sciatica is also referred to as pinched nerve. This results in leg pain, which is also known by the name of radiculopathy. A person suffering from sciatica is going to feel sharp, shooting pain at the time of sitting, standing, laying down and walking. Sciatica can be treated by various methods, but today, we are going to discuss acupuncture, as to how it can bring relief to the patients suffering from sciatica. Every treatment methodology has its own primary role, and for acupuncture, the role is clearly set, i.e., it will provide relief to the patients. It does this by relaxing the muscles, which may be tight and putting pressure on the nerve. Nerves that are either coming from the lumbar region or from the muscles, acupuncture is going to loosen them up. Acupuncture therapy starts off with taking the patient’s history and performing an examination of muscles along with the points where acupuncture procedure can be performed. The muscle is going to feel smooth to the touch followed by a sudden change in the skin texture, which will confirm that there is certainly a blockage in the muscle. If there is a pain in the muscles then the acupuncture points are going to feel cold, warm, soft or really hard. The feeling will be a lot different than the surrounding muscles. These points are where needles must be placed. Acupuncture while giving acupuncture therapy will never insert needles into nerves, but he/she will insert the needles into the muscle at the acupuncture site. It will pain a lot if the needle is inserted into the nerve, and you can relate that feeling to the pain of the dental work without numbing the working area. Moreover, it is not possible to needle a nerve, no matter what acupuncturists do. The placement of needles has to be done very carefully. With the insertion of the needles, it should create a micro-trauma in the region, which will stimulate the body’s own ability to heal itself. A human body is constant repairing itself on a cellular level, but the benefit of acupuncture is that it channels the healing response to the specific areas of the body so that the blockage can be cleared in order to allow healing. If you are in need to get acupuncture therapy for sciatica Melbourne, then you need to get in touch with Back Solutions Clinic. They will provide you with the best acupuncture therapy that will clear all the blockage from within your muscles. 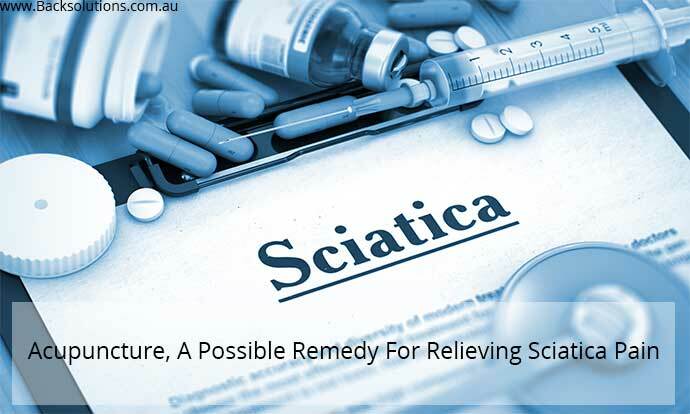 Back Solutions Clinic has made a name when it comes to treating bad sciatica nerve Melbourne. So, don’t waste your time and consult this clinic right away.